← A Look Forward: How Will Kiribati Fair? Over the last month, newspapers have been flooded with information about coral bleaching – what is great to raise global awareness about this very serious problem affecting such an iconic ecosystem. However, the reason this has happened is really sad: the great barrier reef has succumbed to the third global coral bleaching event, and has been affected very intensely. About 95% of reefs are severely bleached, and mortality of up to 50% has already been reported (1). This shows us that the third Global bleaching event is a serious treat, and certainly is not over yet. The reef area we have been monitoring since February – the Abrolhos marine national park – has been suffering the consequences of the El-Niño on the last month, and has already been through 2 Degree-heating weeks (Figure 1). A degree heating week is one degree Celsius above the local mean summer temperature, what for corals means temperature stress and, possibly, bleaching. In the last 3 years, Abrolhos has consistently faced 1 degree-heating week during the summer (Figure 1), and fortunately no bleaching has been reported. However, it is clear that the current stress had an earlier onset, in addition to being the biggest in the last couple years, and , of course, it is not nearly over yet. In the last couple years, Abrolhos has been relatively resistant to Bleaching. The last relevant event of the type described in the literature dates to 2007 and 2008 (2), but since then, a happy no bleaching gap of 8 years has persisted. NOAA predictions though (Figure 2) show that the heat wave is not near to an end yet, as in the next 4 weeks we should see a continuation of the unusual heating. For weeks five to twelve, as the fall goes on in the south hemisphere, the thermal anomaly over Abrolhos is predicted to form a discontinuous with other heating in South Atlantic, resulting in a hot spot, that is, a point in the ocean where the temperature is higher than anywhere around it. With that, it is possible that Abrolhos will face a Bleaching Alert in the near future as the degree heating weeks accumulate, and it is possible that the no-bleaching 8 year gap could be over. 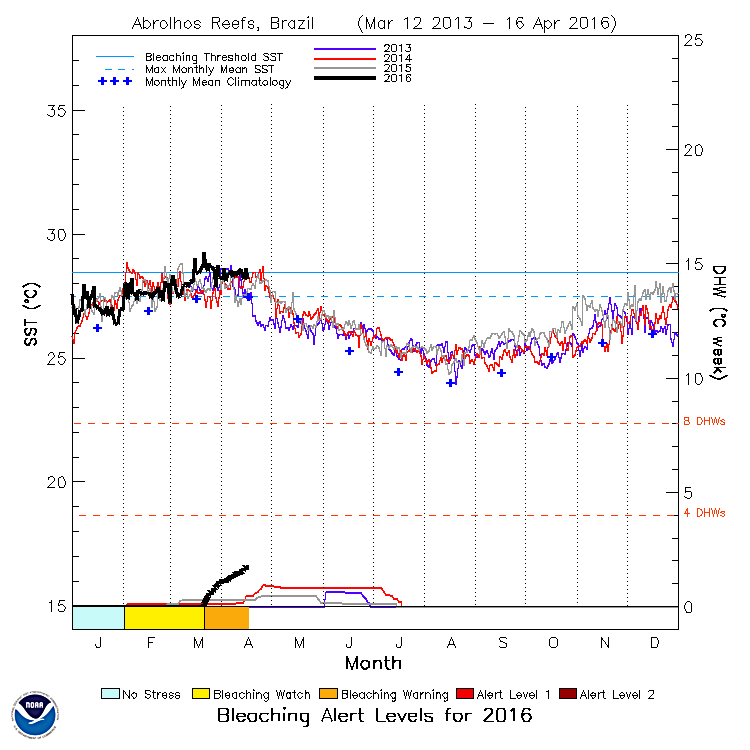 Figure 2: NOAA Satellite Coral Bleaching Alert Area and Outlook for Abrolhos Reefs. In upper left, Abrolhos is delimited by Black line. Note that the area is subject to stress in the next 3 months, with the appearance of a hot spot over the Abrolhos region. Figure adapted from (6). Brazil has been going through a very serious economic and political crisis (3), that virtually ceased the transfer of money to public research in the country, having a deep effect on scientific production (4). Fortunately, given the conservation relevance of Abrolhos, there is great interest in the region, and besides this unfavorable context, researchers in the Federal University of Bahia (UFBA) have monitored the reefs in the area during the last week of March. As of the date of writing of this post, their results have not been published yet, and further educational and scientific material resultant of their field campaign will soon be publicly available. For the future, because Abrolhos is an effective national park, we expect that the local pressures on the reef, such as over-fishing and nutrient overload, will be maintained over control when compared to other unprotected areas. In that context, it is likely that the Abrolhos reef will be more severely affected by global –rather than local- changes. However, there is the description on the literature of a disease outbreak (7) that coincided with the last bleaching outbreak described for the area in 2007-2008. Since both events are related with thermal anomalies, the status of diseases as local factors is uncertain, and it is possible that bleaching and diseases act together to threat the reefs in the region. Additional stress is imposed by another global, climate-change related, factor: the increased CO2 dissolved in the water. The South Atlantic is currently affected by this, and is also likely to be affected further in the future as the problem gets worse (8). 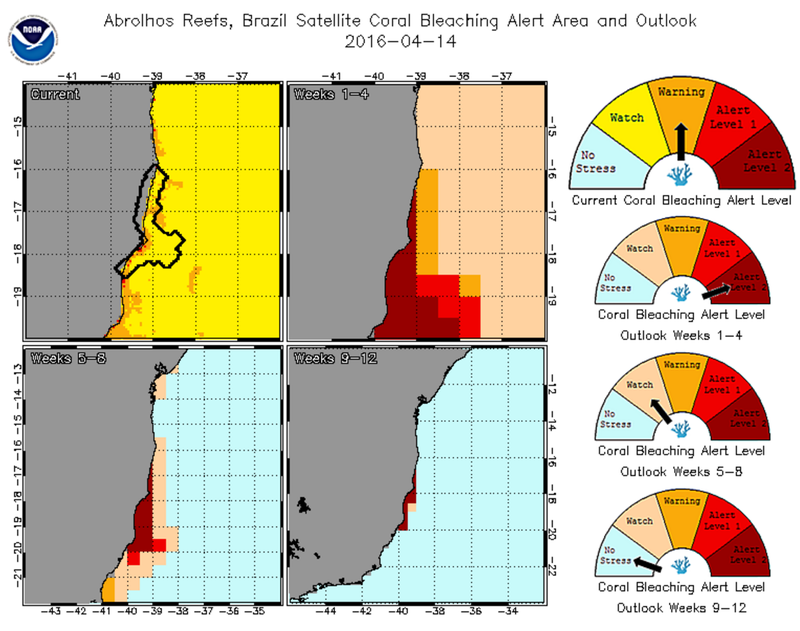 Given NOAA predictions (Figure 2), and all the global threats for the global reefs in the future, we cannot predict a certain brilliant future for the ecosystem in the South Atlantic. However, we can still look forward to the results to be published in the near future by UFBA researchers, and hope that Abrolhos heroically resists the stresses, contributing to the conservation of South Atlantic reefs. Go, Abrolhos! (3) de Carvalho, F. J. C. (2016). Looking Into the Abyss? Brazil at the Mid-2010s(No. wp_860). (4) Gibney, E. (2015). Brazilian science paralyzed by economic slump. Nature,526(7571), 16. (7) Francini-Filho, R. B., Moura, R. L., Thompson, F. L., Reis, R. M., Kaufman, L., Kikuchi, R. K., & Leão, Z. M. (2008). Diseases leading to accelerated decline of reef corals in the largest South Atlantic reef complex (Abrolhos Bank, eastern Brazil). Marine Pollution Bulletin, 56(5), 1008-1014. (8) Kerr, R., da Cunha, L. C., Kikuchi, R. K., Horta, P. A., Ito, R. G., Müller, M. N., … & Pinheiro, B. R. (2015). The western south Atlantic Ocean in a high-CO2 world: current measurement capabilities and perspectives. Environmental management, 1-13. This entry was posted in Uncategorized and tagged Abrolhos Marine National Park, bleaching, Branqueamento de Corais, Brazilian Coral Reefs, Corais Brasileiros, Pedro. Bookmark the permalink.